Download and install TI-Nspire Computer Link. If you have a calculator that is not the CX, select the model that corresponds with yours. The program is only for Windows and Mac OS X/macOS (Linux users try Wine or VirtualBox). Download a .tns (TI-Nspire document) to your computer. Plug your calculator into an open USB port on your computer with a mini-USB cable that was included in the calculator packaging or one laying around in your dwelling. Open TI-Nspire Computer Link, select your calculator, and drag in the downloaded .tns into the bottom file list. Make a table with 2 columns and 1 row. Label the first column "M" and the second column "A". Multiply the coefficient of the first term and the last term. Put the product under the "M" column. Take the coefficient of the middle (second) term and put that under the "A" column. Think or list the factors of the number under the "M" column that add to the number under the "A" column. Take into consideration negative values. Once the two factors are found, rewrite the trinomial, replacing the middle term with the 2 factors and the variable. This program finds those 2 factors for you. "M" and/or "A" should never be 0, otherwise the program will return nothing. 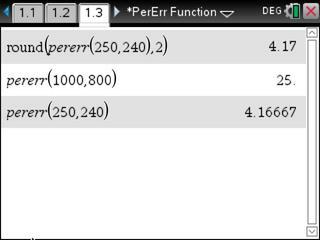 This program finds the percent of error of an estimated value and the actual value. Have you ever found yourself bored after a quiz or a test and wanting to look at something mesmerizing? Here you go, it's a color-changing rectangle/square with adjustable speeds. The two GIFs below use the fastest speed setting. I took all screenshots with the TI-Nspire CX Student Software and recorded all GIFs using firebird. I own a TI-Nspire CX running OS 4.2.0 and with ndless installed.